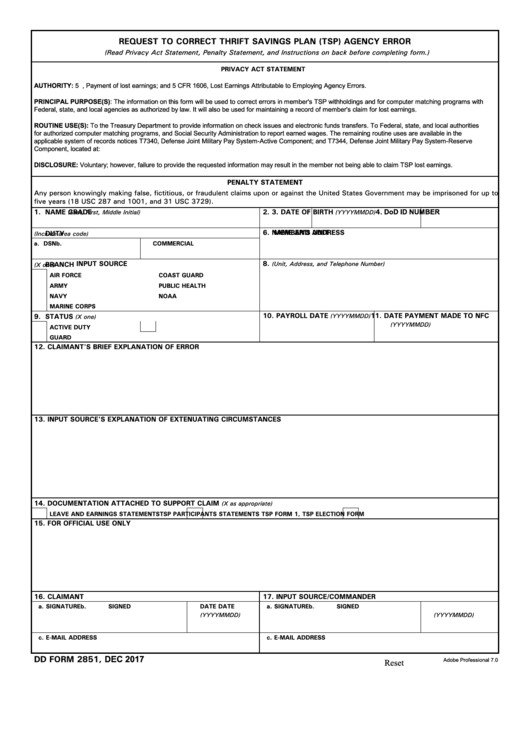 Download a blank fillable Dd Form 2851 - Request To Correct Thrift Savings Plan (Tsp) Agency Error in PDF format just by clicking the "DOWNLOAD PDF" button. Complete Dd Form 2851 - Request To Correct Thrift Savings Plan (Tsp) Agency Error with your personal data - all interactive fields are highlighted in places where you should type, access drop-down lists or select multiple-choice options. AUTHORITY: 5 U.S.C 8432a, Payment of lost earnings; and 5 CFR 1606, Lost Earnings Attributable to Employing Agency Errors. Federal, state, and local agencies as authorized by law. It will also be used for maintaining a record of member's claim for lost earnings. DISCLOSURE: Voluntary; however, failure to provide the requested information may result in the member not being able to claim TSP lost earnings. five years (18 USC 287 and 1001, and 31 USC 3729).